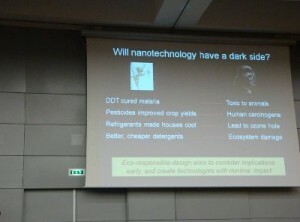 MIO-ECSDE in its commitment to keep up with the latest developments in the field of Nanotechnologies participated in an OECD Conference entitled “Potential Environmental Benefits of Nanotechnology: Fostering Safe Innovation-Led Growth” which was held in Paris, July 17-19, 2009. The conference covered both the opportunities and the challenges of the use of nanotechnologies for potential environmental benefit. It provided an opportunity for approximately 165 participants from governments, academia, industry, and NGOs coming from 29 countries to consider the state-of-the-art of nanotechnologies and their potential to bring environmental benefits and address the potential human health and environmental safety concerns. In particular, the conference addressed sustainability and life cycle aspects in a variety of sectors in which nanotechnology has the potential to give rise to environmental benefits. There is a need to go back to the basics, apply an integrated approach, meaning to integrate nanoscience with toxicological, biological and ecological studies. Nanoapplications and nanoproducts should follow an eco responsible design through new efficient synthesis processes. There is a need for early dynamic engagement in a predictive and effective regulation. Guidelines on a preliminary approach are needed. The key challenge is to engage societal aspects-dimensions in innovation. This could be achieved by multi-stakeholder involvement. A hazard driven and not an exposure driven approach should be applied. Strategies and protocols for rapid and precise characterization of nanoparticles toxicity should be developed. Also methods to measure exposure should be developed as it is very difficult to distinguish exposure values from the values of the natural background. There are indicators of concern for nanoparticles such as poor traceability and unknown fate. Many nanotechnology applications are still at the embryonic stage and benefits are still at laboratory level. Caution should be given to the fact that there are products that use nanotechnology techniques but do not contain nanoparticles. Nanoapplications should be bound to patience and we should go one step back to lower the dynamics. Sustainability and recycling issues should be considered through Life Cycle Assessments (LCAs). Nanotechnology might lead to polarization of global societies. There is a need to bring the issue of Nanotechnologies into education. The first one was about ‘Sustainability and recycling issues’ by Prof. Armin Reller (University of Augsburg, Germany). Prof. Reller identified the fact that more and more nano applications use rare exotic metals such as Ce, Nd, La, Ga. As a result, in the last decade 69 metals have entered the biosphere, which previously were only bound to rocks. This has the potential of creating problems. On the one hand these metal resources, which can be found in very few countries, may lead to several socio-economic implications and also the issue of respecting natural resources may arise, as no recycling process has been foreseen.